Some of last month's global news stories may surprise you–from fast-food to politics to religion, here are 12 weird headlines from March 2018. There was some good news and some bad news for a beloved global fast food chain this month. Kentucky Fried Chicken had quite a dilemma on its hands in late February when its British stores ran out of chicken to sell. This development, which was due to KFC's parent company, Yum Brands, switching to a new delivery contractor, had KFC lovers across Britain in panic mode, with some even contacting the police about it. 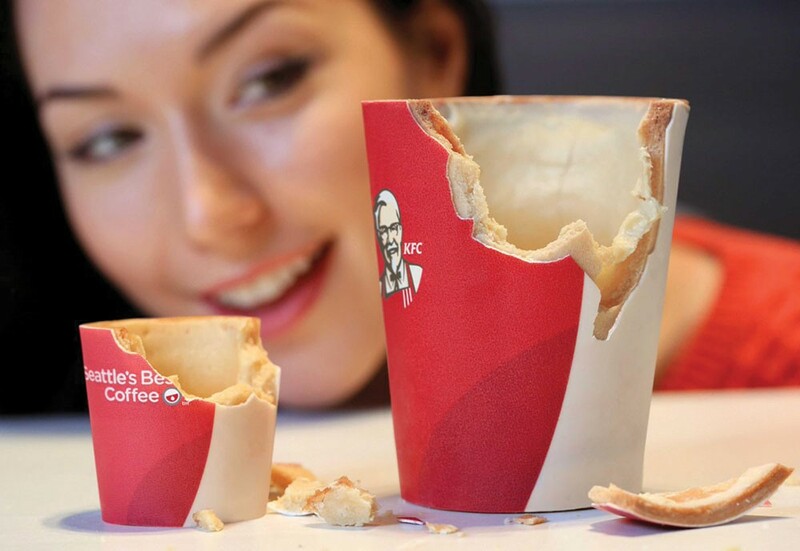 On the lighter side, KFC is also introducing a new food innovation that promises to boost profits and benefit the environment: edible coffee cups. The cups will be made out of wafer coated in sugar paper and lined with white chocolate. According to billionaire Warren Buffett, President Trump's tax reform bill helped Buffett's multinational conglomerate Berkshire Hathaway rake in an extra $29 billion in profits this year. The bill, entitled the "Tax Cuts and Jobs Act," was passed in December and has begun started taking effect. It has been roundly criticized by Democrats both for eliminating the state and local tax deduction–which is seen as a swipe at bluer and non-Trump voting states–and for cutting the corporate tax and taxes for the richest 1 percent of Americans. Buffett, who has long been an outspoken advocate of progressive taxation, believes it has had its intended effects for billionaires and their companies. It's a common perception that gig-economy jobs for companies like Uber or Seamless are generally higher quality than jobs in the service or manufacturing industries, but a new survey of 1,100 ride-sharing drivers is casting doubt on this assumption. A study by MIT's Center for Energy and Environmental Policy Research found that the median pretax income of Uber and Lyft drivers is a meager $3.37, well below the $7.25 federal minimum wage. It also showed that 74 percent make an income that is below their state's minimum wage, and 30 percent make a net loss when accounting for the fact that they have to pay for their own vehicle expenses. The legality of this low pay may hinge on the fact that drivers for these companies are technically contractors and not employees, and therefore Uber and Lyft are not required to set a rate of pay for drivers. Since Andrew Wakefield, a disgraced former doctor from the United Kingdom and a prominent anti-vaccination activist, arrived in Texas in the early 2000s, the rate at which children aren't vaccinated for measles, mumps, and rubella has skyrocketed. Wakefield is now delving into politics by backing Susanna Dokupil, a conservative Republican running an anti-vaccination-charged campaign against a moderate Republican state lawmaker who fought to mandate HPV vaccines for foster children. Dokupil's Houston district houses 2.1 miles of hospitals and research institutions, and a win by her, Wakefield, and their allies would give anti-vaxxers a huge foothold in a state in which they've already been making inroads. After spending more than half his life on death row, Doyle Hamm returns there once again after a "gory" and "botched" attempt at lethal injection left him very much alive but with 12 puncture wounds. Hamm's lawyer argues the state tried to rush through a specialized execution protocol because his health history–which includes having terminal cancer and past intravenous drug use–left his veins severely compromised and less susceptible to the injection. Shortly after the execution was called off, the Alabama Correction Department's Commissioner stated, "I wouldn't necessarily characterize what we had tonight as a problem." An unlikely nation has been caught ramping up its surveillance capability and carrying out a massive program of domestic spying. Norway built a massive, state-of-the-art surveillance base code named "Victory Garden" and has been working closely with the NSA to spy on Norwegian citizens and their foreign colleagues. The oversight committee that monitors the country's espionage programs deemed Norway's searching of its citizens' communication records to be "legally dubious." The Victory Garden facility was being pitched to both voters and allies as a necessary asset for Norway's overseas defense and fight against global terror. In order to obtain an EB-1 immigration visa, often referred to as an "Einstein visa," a candidate for US citizenship through the program must prove they have won a major award—think Nobel Prize, Pulitzer prize, or Olympic medal—or meet three out of ten criteria, such as commercial success in the arts, evidence of an original contribution to a field, or evidence of artistic work being displayed in an exhibition or showcase. It is possible that First Lady Melania Trump may have met those criteria when she applied for, and ultimately obtained an EB-1 visa, as was revealed in February. However, many reporters believe that the First Lady's resume at the time doesn't appear to have been strong enough to qualify her for the visa, prompting some to wonder if her husband had a hand in tipping the scales.